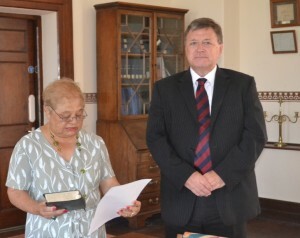 Greta Pat Musk MBE JP has been reappointed today as Sheriff of St Helena by His Excellency Governor Capes. Mrs Musk took the prescribed Oaths before the Governor, in his office at the Castle, (photo attached). Mrs Musk’s appointment becomes effective from 1 January 2014 until 31 December 2014. The Sheriff of St Helena is nominally responsible for enforcing Court Orders, with this being usually carried out by the Police Service on the Sheriff’s behalf. The Sheriff is also responsible for summoning Jurors when a Jury is required either in the Supreme Court or for a Coroner’s Inquest. Her most conspicuous public role, however, is the swearing in of Governors and Acting Governors.